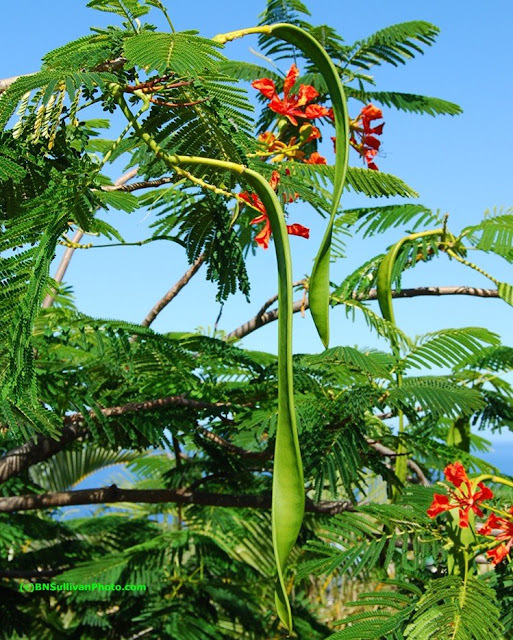 Seed pods are sprouting on the Royal Poinciana trees in my garden. The new seed pods, which resemble long green beans, are between 12 and 18 inches long (about 30 to 45 cm). The pods are green and soft right now, but later they will harden and turn brown as the seeds inside mature. This is the latest photo documenting the seasonal stages of the Royal Poinciana. In May I posted a photo of buds on a branch of one of the trees. In July I posted a photo of a single Royal Poinciana blossom, and another of a mass of blossoms on the same tree. Later, I'll post a photo of the mature brown seed pods -- but as of today, the pods are green. UPDATE: Here is a photo of a mature Royal Poinicana seed pod. Beautiful shot Bobbie! I see you use a Nikon 40x I have a Nikon 40, I was just wondering how you like it? I just love mine. Just gorgeous. Makes me long for a day in Hawaii! Happy Ruby Tuesday! Love photo, can't wait to get back to Hawaii. Absolutely gorgeous! I want to be there, too! Hi Bobbie, these are beautiful red blossoms. I have not seen the Royal Poinciana to my knowledge, but if they are common on the Big Island, then I have see them. We spent about ten days in 1988 on Hawaii. Six of those nights were spent at Mauna Kea State Park. I would run for several miles every morning out on the road below. It was all sooooo nice. Besides the camping, we did a circular driving tour of the island, from Hilo west, north, east, and back south. Thank you for checking on my Russia post, I could not upload new pictures this evening. What a wonderful tree - I have never seen a Royal Poinciana before. Interesting green seed pods and lovely orange/red blossoms. Great photo! What an interesting tree. Thanks for sharing the various stages with us. I am intrigued with different vegetation. This tree looks gorgeous and I love the long seed pods. Beautiful photo! Thank you for your comments opn my Redstart. What unique looking seed pods. I do remember seeing the beautiful red flower. Will look forward to the dried version. Happy RT. It looks very beautiful ! we don't have these plant here in Belgium. This was a real treat for me...seeing the Royal Poinciana in bloom again! We lived in south Florida for many years but the past 20 have lived in north Fl. I always loved these trees and miss them! This photo is really nice! What large seeds - I only remember seeds as being little hard things. Except in paradise. With the beautiful large panoramas and twice or more the beauty of anywhere else, why not larger prettier seed pod too? What a fun tree. I love the beautiful green and the splashes of ruby!! I enjoyed reading your comment about your Nikon! It is on my wish list. Unfortunately so is dental work and a new car! What a wonderful photo and what an incredibly cool plant. Those seed pods are awesome and the flowers aren't too shabby either. I always wanted to see Hawaii. It must be so amazingly beautiful. I enjoyed scrolling down the page and seeing your other wonderful pictures too. My gosh - those pods are huge! I can't wait to see the seeds! That is interesting tree and it's beautiful. Re: About the bus decker that I've posted I believe it's left hand drive. I've never been inside and I was far when I took the picture! Thanks to all of my Ruby Tuesday friends for visiting. @ Jim - The Royal Poinciana only blooms from late spring until around this time of year, so depending on the time of year you visited the Big Island, you may well have missed seeing them. @ Junie - I would miss these trees, too, if I were to move away. @ Dianne - Good things come to those who wait! You'll get your camera one of these days. To those who commented on the size of the seed pod, they really are large, but each pod has many, many seeds inside -- sort of like a pea pod, only much longer. They do look like string beans. Thanks for the links to the previous pics so I could follow its stages of growth. You're welcome. Glad you enjoyed the series. Great photo of these seed pods, Bobbie. I've never seen a tree like that. You are surrounded by beauty there, aren't you? Thanks, Patti. Yes, life in Hawaii has its drawbacks, just like anywhere else, but one thing's for sure -- it's always easy on the eyes. Do you sell the pods? I would like some of the large brown dried woody pods. No, we don't have any pods for sale. Sorry. You are welcome to use the comments section of the posts to add your remarks, or to ask questions. 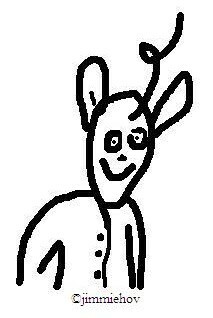 Copyright Notice: All of the images on this blog are original works, copyright (c) B. N. Sullivan, all rights reserved.